The ashes of a fallen warrior and his axe floated over Silvermoon, as Thoraggar’s world grew dark. He had the luck of bearing no mark from Accalia, but another arguable worse one graced his arm. The victory in Moonglade sent him scrambling to Silvermoon to Leoren’s trial, rather then suffer the secondary effect from the Eclipse. Out of the darkness after what seemed like an eternity, a pair of fiery eyes emerged from the dark, a second set, a dark blue or torques hardly eyes at all it seemed. A third pair, dark and molten appeared, set deep in what seemed to be stone caves, and a fourth, pink orbs that flashed lightning, all illuminating the darkness. As the light grew Thor found himself before a council of elementals. A heavy rock hand extending to the horizon, the city of Shattrath looming into view “show us, mighty Thoraggar Unforgivable, how you forged your namesake.” The council and elders faded into Terrokar Forest, and as if to twist the dagger like feeling in his chest, he saw the elder lower their heads in shame as the faded away. And Thoraggar found himself alone outside the walls of Shattrath. Unlike the Shattrath of his recent memory, this one seemed fortress like, like a sand castle fortifies against the coming tide. Earthen ramparts surrounding the city, beyond the walls of the Lower City. Upon these ramparts and walls stood Draenai vindicators, poised resolute, if not resigned, looking over Thoraggar to the greater forest. Thor followed their gaze, a thunderous army appearing just in the tree line, siege engines rolling forward with maniacal creaks and groans. One young Orc in the throng caught his attention. The young orc, barely of age for war, would run his hands over the machine’s frame and look to the walls with a twisted grin eyeing the defenders as one watches a rodent before crushing it. Thoraggar knew this young orc’s part in the creation of these machines of destruction, and he would reach for his goggles instinctually to draw them down over his eyes, only to find them absent. “The skies wept when the orcs laid siege to Shattrath City. Drums echoed through the forest, stirring the masses of orcs as all eyes focus on the walls, then beyond it, fiery eyes gleaming with the promise of bloodshed and slaughter once those walls fell. A more sinister grin crossed the young orc face knowing some of his machine would allow such bloodshed to commence. “For the Horde! For the Legion!” erupted from the army, as they strode forward under the bolts and stone hulled by the machines. Ogres stormed to the front ranks and brought their might against the walls, easily tearing through the first ramparts as predicted. Thoraggar lost sight of his younger self and the Horde passed by and through him. He’d sooner walk this spirit would of Terrokar then observe his past, without the mercy of the Blood Haze making it all seem right. Then a small hand tugged at his massive one, and he looked down to see a small Draenai girl pulling at him. And oddly familiar faced looked up at him, though he couldn’t place it. She looked up with a smile, and with unnatural strength pulled him forward to the now shattered gates. Though she even seemed unaware of said strength, Thor now knew he had no choice but to follow, as she skipped through the murderous onslaught in the same manner Thoraggar passed through them. A red mist began filling the Lower City as they passed through, choking the all the Draenai present, save one, and fueling the rage and blood lust of the orcs present, save one. The unique pair caught up to Young Thoraggar as he dispatched one of the defenders with an axe handle to the throat, crushing his windpipe and trapping the toxic haze inside his lungs. Licking the blue blood from his axe with a grin, the same axe that shared his fate at the hands of the magisters, something caught his attention on one of the upper rises. Thor and the little girl followed his gaze to Aldor rise. “No…” was the only plea the older Thoraggar could manage before his younger self stormed upwards, the Draenai girl following, large hand held captive in hers. A pair of other warriors followed them upwards, Thor watching the grin on his younger self growing ever bigger, as his own heart sank. The grin turned to a full blown smile as the fel-enraged orcs reached to top of the rise to find but two defenders. The first was a vindicator who’s charge was abruptly halted by Thor’s axe under his right arm, the follow through unceremoniously tossing him from the tier to the Lower City bellow. The second stood little chance, as the other two orcs overwhelmed her, ripping the small dagger from the priestess’ hands and pinning her to the ground, as the small party of children behind he gasp in horror at the green beast before them. The other two where only stopped from slaying the woman by a grin and an upheld hand from Young Thoraggar. “Wait, Thor thinks she should see how smart her children are,” his smile given over to a mischievous grin. “Who is that?” a tiny voice beside Thor ask, its calm questioning out of places as the battle raged bellow. “Thats…me” he returned, as his clear mind linked who he once was, with who he is. “What’s he doin’?” inquired the tiny voice again. “Thor..doesn’t know,” he lied as one lies to child in an attempt to shield them from the bitter truth. “Do you know what this is?” the younger orc’s voice ask the nearest draenai child, holding out a coin. The child remained stoically silent as the coin sailed through the air, “head or tails?” the voice ask again, catching the coin in his palm, and holding till the tiny creature answered in a timid voice “tails.” “Ohh heads” the gruff voice answered mockingly revealing the coin in his hand before grabbing the child by the horns with one hand, axe in the other, and dragging him to the edge of the rise. Thoraggar’s hand went to cover his tiny accomplices eyes but she pushed it away and watch horrified as the younger Thor tossed the child into the air, his axe whistling as it split the child in half mid-air, to the screams of the priestess. The mischievous grin looked over the edge as the two pieces fell into the lower city. “What do you know, it was tails” it would mutter with a grin to the other two orcs, their laughter accompanying the priestess weeping. The Draenai girl accompanying him would look back and forth between the Thoraggar she clung to, and the one continuing to end those just like her, turning the events before her over and over in her child’s mind, until only one child and the priestess remained, both sobbing. Though a touch of resistance still graced the woman’s face as young Thor walked away from the edge and lifted her head. “Kids, always falling and skinning their knees huh?” Her spit was the only answer she offered, and he replied in kind with an elbow to her cheek, his grin never leaving as his engineer pondered the situation. The sudden realization of where he knew this Draenai girl at his side from came a moment to late, as her hand left his and she moved from the his new spiritual world to his haunted reality. Ropes secured around the confused priestess wrists secured around the two remain children’s waists. Tears rolled down his cheeks as nooses where places over the children’s necks and secured to the tier. The priestess now adopted a stoic look, sure her end would come soon, as she and the children where dragged to the edge of Aldor tier. It wasn’t until she examine the rope pattern she realized her time was long in coming, and then it was to late, as a heavy boot sent her over the edge, the lines from her wrists paying out behind her to the children’s waist. Thoraggar’s tiny companion looked to him, the only one aware of his presence, as the rope went taunt “You can’t be him, your nice,” she managed to say sweetly as the rope dragged her and the other child over the edge. The next sound rising up from the dying battle below was that of two small necks snapping and a Draenai woman yell as she dangled over her ruined city. They said time would heal all wounds. It may as well have been a lie, Leoren was sure of that much. Time did not bring his closest friend back from the grave, a life that would not have been forfeit if not for his own. It had only been but a month after Thoraggar’s death, and nothing Leoren did could ever make the wretchedness and guilt in his heart fade. His history with Thoraggar... their unlikely friendship was one that preceded the alliance of their peoples, dating as far back to the aftermath of the second war. Where other companions and friends had abandoned and betrayed, it was the orc who delivered the girl Beth to his orphanage’s doors who’s loyalty would have proven timeless. Even until his end. So much had happened since then. So much else had been lost in Leoren’s life. Yet still... So much had been forged from the same fires that would have taken so much more. 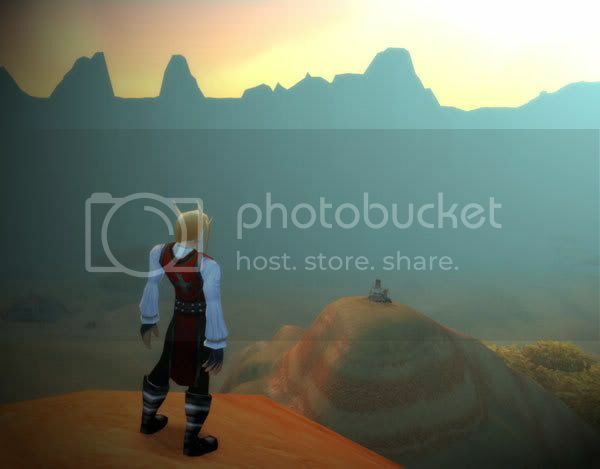 Leoren stood alone atop one of the Barrens’ mountainsides, the shrine of the fallen warrior in clear view. It was a place for mourning heroes now gone. A Lok’vadnod. An orcish custom. Songs written and sung in remembrance of fallen heroes of their people. Leoren was no orc, but he'd be damned if one of his dearest friends' life came to a close without one. The memories of his life would be remembered, and his self sacrifice honored. His voice came resolute as orcish words gave life to a song mournful and reverent. Stood Thoraggar of fire and might. No fear could stay his part. Now cast upon the winds. Yet his song has just begun. Naheal looked over to the Anchorite who approached him at the Altar of the Shai'tar near his workshop, his tools beside him while he sat on a bench. "Yes, miss?" "You said his name... was Thoraggar, correct?" He nodded. "What... was he like?" He smiled. "He was... kind. Tolerant. And, actually, very intelligent, even if he was illiterate and always refered to himself in the third person." She cocked her head. "He always refered to himself as 'Thor' as opposed to 'I' or 'me.'" She nodded. "Where is he now?" He turned his eyes down. "How...?" "In defense of someone who was wrongly accused..."
"He would charge into combat and take the brunt of an assault to protect those who couldn't take a hit. He would carry those who couldn't walk. He even guided one who was led astray from the light, even protected her from harm." "Tassha?" He nodded. She gave him an odd look. "That blood knight... he wasn't Draco Visca, was he?" Naheal looked over at the Anchorite as she lowered her voice. "He was you, wasn't he?" "Keep that secret. I don't want to be known as that man." "Because then people will sing for me as if I was a hero. I wasn't a real hero, there." She blinked. "The real hero..."
He stood and walked away. "Was Thoraggar." Nether, priest of the Light, stood aghast as he heard the tale of the fall of the mighty Thoraggar. At first, upon hearing it, he couldn't believe it. No force on Azeroth had seemed powerful enough to bring the tenacious warrior low. As the cold truth sank in, Nether wandered in a dumbfounded haze, to collapse on a nearby bench where he sat listlessly. In his mind, he could see the maniacal grin of his friend, smell the powder-smoke that clung to his armor, hear his bellowing battle cries. He could feel the hot blood pouring from the countless injuries accquired in the defense of the priest and his allies. Though he could count on his two hands the number of times they had had what could in any way be called a conversation, almost all of Nether's time serving the horde had been under the protection and banner of his fallen comrade. Nether now regretted all the missed opportunities, all the things he could have said. After almost an hour of bitter regrets, the priest rose and began walking. He purchased a bolt of pure shadowcloth, which he deftly made into an arm-band. He would wear it always, in memory of the happy-go-lucky orc warrior who had made such an impact on him. Nether tapped his hearthstone, journeying to Orgrimmar and riding swiftly to the home that Thor had left behind. He stopped outside, not entering, just looking. He spent the knight there, in silent prayer to the Light, asking for the safe passage and rest of the truest warrior of the Horde. few hours before sunrise, she wipes her dirty face sighs.
" Another failure, seems to be happening more and more recently." ya died saving others. I hope my death can be as noble, but still its not fair." some of the remaining grime. I wouldn't let my friends fall, but ..."
Tora suddenly was quiet, and wiped her tears away with her sleeve. to carry us elves around." embraces the warmth they provide. there with me, that all faded. Its as if your courage was contagious." actually wish i had a Birthday so that ya would do the same for me. " continually trying to talk to ya." “And so here you are, Thoraggar Unforgivable come before us,” spoke Earth, as the world faded beneath him, back into the void, “and yet that you have even been granted an audience is baffling you” added Wind. The warrior sank back to his knees, and nodded at the elements, choking back tears from his past, only able to manage a nod in agreement. In the streets of Silvermoon, the dust and dirt that had been eluding the enchanted brooms began to gather at the edge of a small fountain in the park. A testament to the elements power, that in such a seeming unnatural city their powers still flowed, as the dirt gathered form, and from the waters emerged a scruffy and mud caked wolf. Thor looked around the city, wondering if anyone had seen him, before beginning his search. How would encounter several old friends, his fellow warrior Rannoch, his mate Theira. And even a few new ones, though they may never again see him, a mischivious rogue, a distressed priest from the same rogue, a young orc shaman finding his way in the world. The wolf would sniff the air, and follow as best he could the path the zeppelin seemed to take, crossing through Alliance lands he had only visited in passing, ultimately reaching Booty Bay. The sounds of the shipyard permeated his sense as he swam through the bay, but none keeping his attention like the sound of Leoren’s voice. The closes thing a wolf could smile manifested on his face, knowing his comrade had reached safety. A second voice answered Leoren’s, as the two conversed in elven. Sitting outside the inn door, musing about how the elven language was to full of useless sounds, and that if he wanted to get a word in edge wise, he’d have to get their attention. A foreboding thought crossed his mind; that he didn’t know how much time he had, forcing a yell to his voice to gain their attention. The first, Thor reacted to with some annoyance, also placing a little more space between himself and the two incase they wanted to check. The second question hung in the air, as Thor munched the bread hungrily, before realizing he was the only one eating. With that he looked down at the half nibbled piece of bread between his paws, and then back up to Leoren. Tearing at the bread, and ripping off a sizable chuck, before setting it in Leoren’s lap, looking up expectantly. The elves shared a confused look “I think he wants you to have some.” “No…its fine I…already had some.” To which the wolf nuzzled the bread closer, and returned to his own piece, waiting for Leoren to try the half chewed half slobbery piece of bread on his lap. The wolf would wait patiently to eat again, until a Leoren’s manners overtook his stomach, and with a grin Thor finished off his half, striking almost a salute like pose to Leoren, as he toughed through some of the, in retrospect, better food Thor had ever offered him. The second question, seemed unimportant, until it came up again. “How about a name?” He’d be gone in a short while anyway, another named didn’t matter Thor thought. He hoped it’d be a good one, surely Leoren could think of a good strong name to call a wolf, good strong orc name, for the short time it needed a name. At that, Thor gave up trying to mime a long goodbye, long goodbyes where for people who had to much time. Bananas enjoyed the short time he had with the elves, thoughts of a good bye faded away between the elves chatter and pats given to the wolf. He’d just be glad to spend time with friends. Friends who named him Bananas. It was good to see Leoren was safe, and if he was safe, the rest were. And safe was a good farewell for Thor, as the elves disappeared back inside the inn, the wolf returned to the ocean, dust scattering once again. The Elements shared a glance as their thoughts met, the elders nodding. “And what fate is that? Unforgivable?” They ask, as the orc before them lowed his head and remained silent. “You came before us, Unforgivable, and so we showed you who you where. Is that who you are?” The gravely voice of Earth rumbled. The void below morphed into the barrens from above. Leoren’s song rang out across the barrens, Thor stoically holding his pose, while his Elders moved in unison to a salute. “Then who is the Thoraggar of Fire and Might?” Fire asked. “Is that Thoraggar’s Axe of Thunder?” Water asked. “Is that Thoraggar who’s ashes even now I carry?” Wind asked. “Is that Thoraggar who would stand against tides of darkness?” Earth asked. With that Azeroth began to turn, till a ship came into focus, a smoldering Blood Elf standing at the railing. “Is that the Thoraggar who carries elves, and comforts those weary?” Water asked again. “Is that the Thoraggar who creates beauty from fire?” Fire asked again. “Is that the Thoraggar who creates smiles for his comrades?” Wind asked again. “Is that the Thoraggar who gives strength to those who lack?” Earth asked again. Below faded back to the void. “Is that the Thoraggar the Aldor call a hero?” Asked a small voice from behind the orc. The last voice broke his pose, a voice he recognized, from long ago, as a small blue hand reached up for his. “That can’t be Thoraggar Unforgivable, it must be someone else. Your nice, and that’s you,” said the small voice again, taking his hand, as Thor looked from the Draenai child to the Elements. “Then, if you are not, Thoraggar Unforgivable, who are you?” a voice called from the Elders, as a pair of orc spirits stepped forward. “What shall his name be?” Earth asked the pair. “Thor…amaul doesn’t understand,” the subject stated. “What is not to understand? Clearly Thoraggar Unforgivable is gone, you can’t use that name anymore.” Water informed him. The sky over the Blasted Lands blacked with storm clouds, a gathering of Cabalist cultist assembled at a strange altar, three robed statues gazing down upon them. Their masters looking on as they began another ritual, trying to draw the power the orcs once wielded, to complete some magic now lost at the Altar of Storms. Azeroth turned once more, orc spirits and Elements gathering over their Altar, now profaned by the dark arts being practiced below, unseen by the cultist, though not unfelt, as a harsh wind swept through their ranks. The storm clouds over the altar began to swirl, the old orc warlocks gazing upward, students obvious as they continues their ritual. “These unrepentant ones, still follows of the Shadow Counsil seek our power. We are sending them Thoramaul.” Wind spoke, the unique harsh of the voice filled with wrath. Below a whirlwind swept across the Altar, dust swirls blinding the Cabalist and snuffing out their candles. A small pile of ashes deposited by the wind settled in the center of the Altar, on a bone structure. Their ritual interrupted, all eyes went to the sky, oddly silent lightning arcing from one dark cloud to another. “Show them our power Thoramaul” Earth’s voice echoed like thunder. Earthquakes shook the cultist to their knees, rumbling from the ground filling where the thunderclaps should have been. A heavy boulder, brought down from the cliffs above by the quake, crashes down upon the Altar, crumbling over the pile of ashes. Their student’s eyes met their own, filled with questions, only to be met by the confused eyes of their masters. Had they achieved their goal? Had they bent the elements to their will? All eyes went skyward again, still baffled by the silent lightning. “Show them the power of your people Thoramaul” Water commanded. Torrential rains drowned out all sound at the Altar, droplets piecing the porous stone, gather its minerals and mixing with the ashes below. The elder orc spirits lifted their heads, a single voice from the most ancient leading a long lost war-song. The song reached to the orc warlocks below, their eyes widening in recognition, the lyrics filled with the grim fates, and tales of glory won battle. The single voice was suddenly joined by the others, a war-cry shook the skies, thunderous rumblings, filling the cultist with more confusion and fear rather then answering their questions about the silent lightning. “Only on thing remains, what is your last name, Thoramaul?” Fire ask. Thor’s mind was blank, amazed by what he had already seen. The small blue hand in his tugged, begged his attention. Kneeling beside the Draenai child, one of the many victims of Thoraggar Unforgivable, she whispered int his ear with a giggle “How about Bananas?” The orc’s paused to give her a confused look, her tiny smile looking back, her hand in his. “So be it, return Thoramaul Bananas” the united voice thundered. And once again Thor’s world went blank in a pillar of fire, leaving the spirit world in the same way he had arrived. All but the most hardened warlocks shielded their eyes as the sky split, and a pillar of fire spiraled into the boulder, war-song still thundering across in their ears. The boulder split in half, cracked down the middle. From the ashes, a hulking figure arose. Electricity arcing across his naked body, axe in his hand, like a reborn Hellscream before them. “Who…are you?” the cultists master, an aged orc, ask, his voice trembling in fear. Thor felt the tiny hand in his change, the familiar feel of wood and leather, the smell of steel, and yet, the warmth and caring of the child never left. Yet, the rage of the elements burned within him, he could feel their power and rage with each jump of energy. He would rise without thinking, opening his eyes to the first sound that met his ears, and answering the question with a swift upward swing of his axe, hooking it underneath the warlock’s rib cage and hoisting him off the ground. His wrathful voice echoed off the walls, students stunned by the gruesome end of their master, paralyzed in fear at the forces they had dare toy with. Still holding the master upon his axe in his right hand, the lightning across Thor’s body arced toward his left. The power of the elements manifesting there, silenced the rest, as twin bolts of lightning danced across all assemble. Charred and smoking bodies crumpling with a thump, their master hurled from the Altar f Storms over the nearby cliff, students following. The rains ceased, the sky cleared, and there stood Thoramaul Bananas. Looking down at the familiar axe in his hand, familiar in a new friend and old, “Where to now?” he asked her. A light breeze pushed the axe head north, pointing toward the Swamp of Sorrow. “Sounds good” the still naked orc replied, as he began the steady tromp home. While riding through the Blasted Lands one day, the warrior Agnarr Bloodmourne paused on his warhorse for a moment, listening to the wind. "Did someone just yell 'bananas'?" he asked to no one in particular. Shrugging it off, he continued on his journey toward the Dark Portal and beyond. She had come back to the hut after two years, after two days, and it was empty. Tassha stood gazing at the contents of the small hut. It was as uncannily familiar to her eyes as a childhood memory would be for all that only two years of experience separated her from the time she had spent here. It had been a quiet time, a calm time, one that might have endured unchanging for the rest of her life if Accalia's wrath had never rerisen in the mortal realm. But it had, and although only two days had passed in the realm of the mortals, it was a day too late. Thoraggar had fallen defending a friend in Silvermoon and she would never see him again. The early afternoon sunlight washed warmly over the Barrens, permeating the interior of the hut. Crude dishes, rough woven mats, a funny decoration consisting of a couple of arrows. It was a homely place, but it had been something she'd never known before that time... a place to belong, a place to come back to, that she had chosen and where she was wanted. She hadn't appreciated it until it had been taken from her as she'd thought she'd deserved; only then was she able to feel humbled and grateful for the fortune she had had. She turned away, walking out from the doorway and through the thin grass until it turned into pebbles and she stopped at the river's shore. Her eyes turned upward as she looked inward, thinking of the orc that had patiently protected her when no one else believed in her. She appreciated him now, but it was too late. And now, the place she had for two years thought about coming home to was empty. No one awaited her. No one to be glad she was no longer missing. No one to be belligerent and completely irrational about what she had been through. A sad curve came to her mouth. It would have been more than worth it. What was there for her now? Her introspective eyes turned toward Orgrimmar, visible on the horizon. The whole world lay ahead of her; with no one, save one, who significantly cared about her existence, and even that one with his own life to return to, there was nothing to tell her where to go. Or where not to go. But her life's flow had led her here, and she was not unwise enough to think she could fight its current now. The things she had learned, the person she had become, she could not pretend otherwise. As surely as the dead mark lay on her hand, the Light dwelled within her heart and asked of her. It was time to go on. Her studies were slow, but time was something she had plenty of. While her experiences had made her very conscious of her mortality in this realm, they had not driven her to fear death, but to relish the time she had. Every day of Tassha's new life surely made Accalia rage at how poorly Her plan had turned out. The thought only made the elf smile. Then, one night, came the dream. What it meant, she didn't know. She hadn't had such dreams since Accalia's reach had extended between the planes; only the ones she had known were meaningless. But this, this moved her soul, and something within her besides the Light spoke. Before she fell asleep again, she knew that the dry grasses whispered her name. Now was the time to find what was lost.